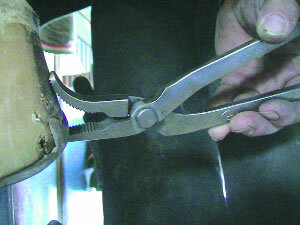 ﻿﻿Two methods of clinching are the hammer clinch and the use of a clinching tool. Both methods have the same goal - to provide a neat, safe and effective clinch. 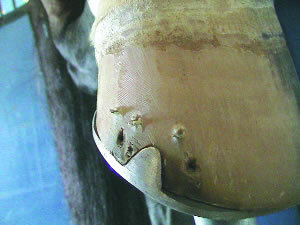 In recent years, many farriers have come to rely almost completely on the clincher in their finish work. The following ideas and pictures illustrate some of the steps that can be used in this method. 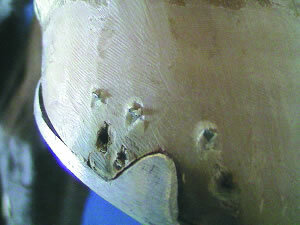 No matter what method you use, your clinches should be of consistent length and smooth when completed. Long clinches add no strength to the job. 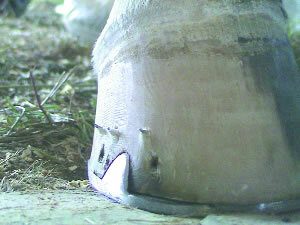 Unless you are in an old nail hole you will always get a bit of hoof pushed out under the nail. 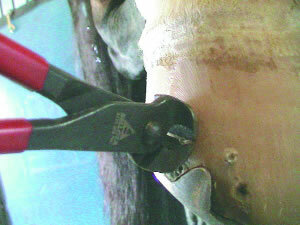 It is most obvious after you have blocked the nails and are getting ready to do the clinching. If you are careful with the smooth side of your rasp or finish file you can clean this up by running the file or rasp under the nail. 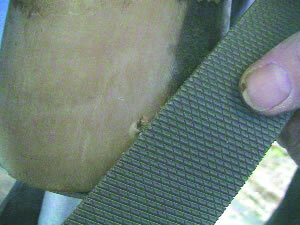 If you don’t take care with this method you can leave unsightly lines between the nails. Some believe these lines, which are often parallel to the ground, create a weakness in the wall, something like cutting glass. It is also very difficult to create a “bed” to set the clinch in using this method. To avoid the possibility of weakening the wall or leaving unsightly marks you can use the undercut method. 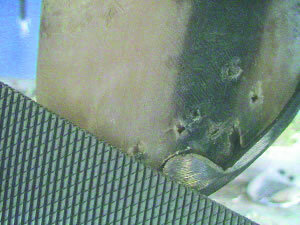 The photos we show below illustrate the steps. 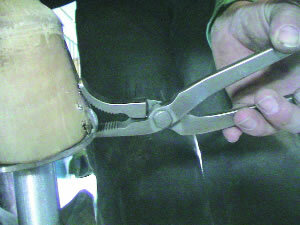 Start by using the clincher to pull the nail to a 90 degree angle to the wall. Then cut the nail very close to the wall. 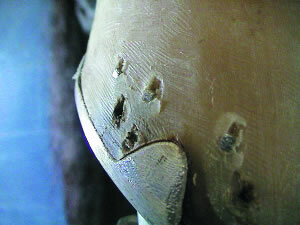 You want to leave only enough nail to be able to grab it with your clincher. 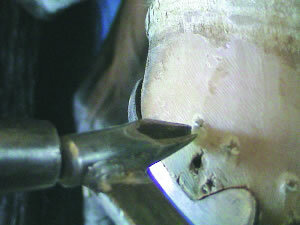 After cutting the nail, use the undercut to cut a scoop or create a bed for the clinch to go in. 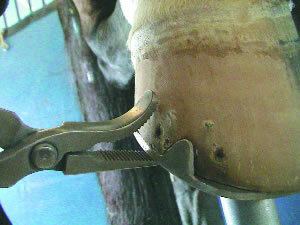 This allows your clinch to be squeezed tight against the hoof without leaving nail on the outer surface to be filed off. In the end you have more nail mass at the bend of the clinch, providing a much stronger clinch and a flush fit with the wall. When clinching, don’t yank downward in a raking motion. 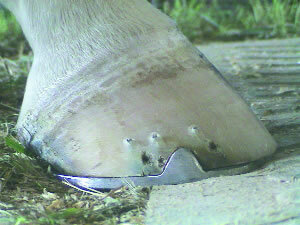 This can tear more hoof below the clinch if the motion is too strong and at the very least leave unsightly marks. You should be able to squeeze the clinchers with a very light motion and bend the clinch over. This squeezing pushes the clinch back into the bed you have created. You might even find that a slight upward motion of your tool, while squeezing, produces a neater clinch, and job, than if you rake downward. 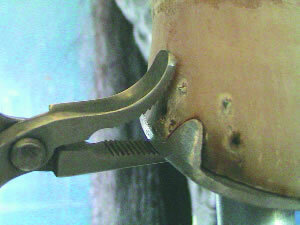 Clincher is used to pull nail to approximately 90 degree angle from wall. Nail is cut almost flush with wall. Undercut can be used to make “bed” for clinch. ﻿With clincher you now squeeze the clinch over - don’t use raking motion. ﻿Finished job with clinches lightly filed and sand blocked. 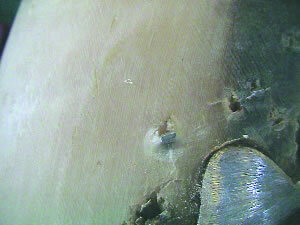 ﻿If you use a file or rasp to clean under clinches work carefully to avoid leaving line or other marks on wall. ﻿Clinching with a curved-jaw clincher, with an angled head, you only need to squeeze to finish clinch- not rake or pull them down at an angle.